I'm the type of cook that usually does not follow a recipe, unless I'm baking. I've been cooking for so long that I have a good sense of timing and what will work together. That doesn't mean I don't use cookbooks for inspiration or follow a complete recipe from time to time. I also found cookbooks necessary when I first stopped eating meat, as I was clueless to many of the endless vegetarian food options. Here are a few of my favorite cookbooks. Not all of them are 100% vegetarian, but these are the ones I refer to the most. Each title links to a page on Amazon so you can get the full info. If you have any favorite cookbooks you would like to recommend, please comment. 1. Cooking the Whole Foods Way by Christina Pirello. 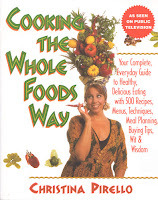 I love this macrobiotic cooking book and I love Christina's kooky, cheerful spirit. If you ever get a chance to catch her PBS show "Christina Cooks" you will see what I mean. Apparently Christina cured herself of Leukemia by changing to a whole foods diet. I would highly recommend watching her show to complement the book, as she is not really an "exact measurement" type of cook. I think some of her measurements in the book can be adjusted to your taste. 2. Vegetarian Times Cookbook by the editors of the Vegetarian Times. I have quite an old version of this book, so I'm not sure what the updated version is like. I also haven't used this cookbook in a while, but it was invaluable when I first became vegetarian. 3. 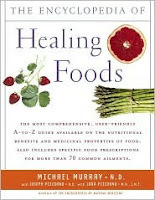 The Encyclopedia of Healing Foods by Michael T. Murray, Joseph Pizzorno, Lara Pizzorno. I looked at this book for years at Wild Oats and finally bought it during their going out of business sale. I don't know what I was waiting for. This book thoroughly explains the nutritional value and medical properties of every type edible food imaginable. It provides cooking and storage methods as well as a history of the food itself. It also includes sections on common ailments and food recommendations. This is a must have for everyone. 4. 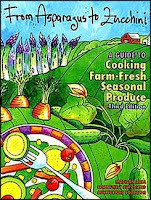 From Asparagus to Zucchini: A Guide to Cooking Farm-Fresh Seasonal Produce by Madison Area Community Supported Agriculture Coalition. I picked this up from my local food co-op and found it to be a nice collection of recipes you might not find in a larger cookbook. This is not strictly vegetarian, but the recipes with meat could be easily adapted as the focus is on the produce. 5. 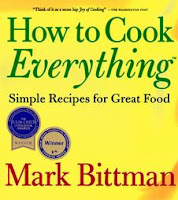 How to Cook Everything: Simple Recipes for Great Food by Mark Bittman. This book does not, by far, tell you how to cook everything, but it is a great resource for preparation and cooking of many of the most common ingredients. For example, I learned how to properly cut a mango and the proper time for cooking a hard boiled egg from this book. The recipes are truly simple, which is great as a basis for your own creations. 6. The Kripalu Cookbook by Atma JoAnn Levitt. Recipes from the Kripalu Center for Yoga and Health, a retreat center in Western MA. I haven't cooked one bad dish from this book and I'm hooked on the Oat Flour Waffle/Pancake recipe. If you are interested in healthy versions of classic dishes, buy this book. Moosewood Cookbook by Molly Katzen - not "The New Moosewood Cookbook", although I'm sure that's just as good and possibly less fattening.